GO BIG! PCC shooters, we were listening when you asked us for more! Our new +20 (51+1) kit isn’t just more capacity, it’s more strength, more durability, more features, and easier to clean — at a very competitive price! If you want “pro-level” equipment for PCC, you can’t do better than this! I love my guys at Taylor Freelance. 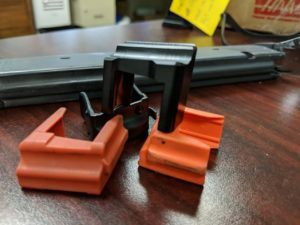 Yesterday we got angry at the cheap followers that came with a pack of Colt 9mm magazines. They were dragging and took a lot of handwork to fix. My guys told me they could build a custom one to fix all that. . and do it in a single day. SHA-ZAM! Behold a custom Colt SMG follower prototype, cnc’ed from super-slick black Delrin. Such is the power of the mighty team of Michael Fox and Justin Eng! Built to cradle our custom springs (they won’t take the “square” Colt spring), this follower is NOTICEABLY slicker/smoother than the various factory parts we used for reference. We’re recruiting some local guys with Colt PCC’s now to do some testing.